With the growing popularity of devices like FitBit and Jawbone UP, technology firms at this year’s Consumer Electronics Show are pushing new gadgets to help track your health and use your biometric data. An analyst working for a large consumer electronics company recently asked us if we have data on just how many people use online tools to track their own weight, diet or exercise routine. It’s a great question since 60% of U.S. adults track those aspects of their health – a significant market opportunity. 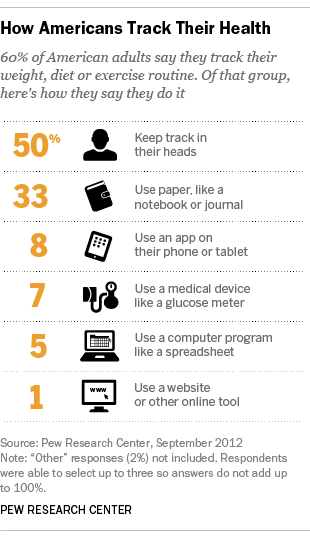 But few of them – just 9% – use either an app on a mobile device or online tool to take notes. Half say they keep track in their heads, and a third use pen and paper. Also, keep in mind that we are not saying the future isn’t rosy for all those companies who are developing online tools for tracking health. But the reality is, for most Americans, online tools are not on the radar screen. Susannah Fox is a former Associate Director at the Pew Research Center’s Internet & American Life Project.